I have been watching and listening to a number of motivational speakers and business people recently, as it is time for me to live out the potential that I have inside of me. Side note: how lucky are we that we live in the age we do and the fact that there is so much information available on the internet. Listening to all of the successful people and writing down what they had to say resulted in me coming up with a thought. When it comes to failure you have two options. 1. 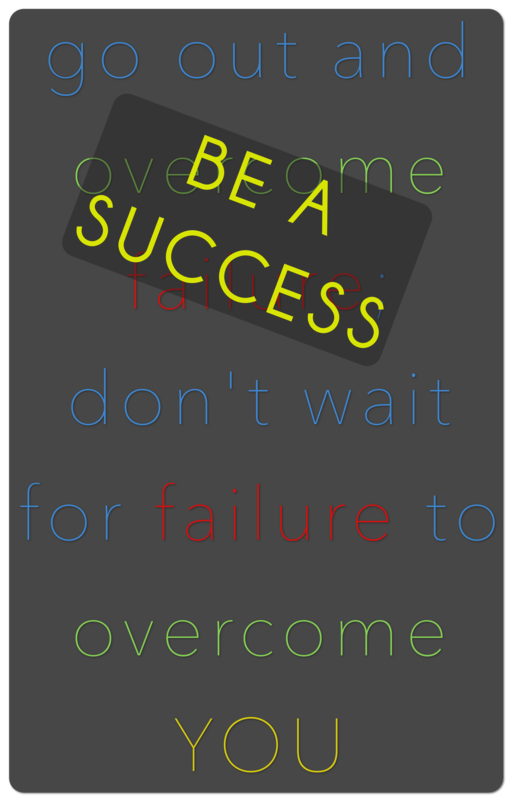 Do something and avoid failure or 2. let failure overcome you. I hit the internet looking for the person who most likely said “go out and overcome failure; don’t wait for failure to overcome you” and was somewhat shocked that no one had. I thought to myself here is a good quote and it is mine. Thanks to the wonder of the internet I have the ability to share this quote and possibly change someones life without knowing, so I decided that is exactly what I would do. In order to make sure that I increase the chances of my quote being memorable I made it look good by turning it into a colourful picture. As I looked at the picture it hit me that this was not a great quote. No, this quote focused on failure and if you focus on failure then failure is what you are attracting. The quote had to change, it is not as clever but is better. I would like to speak to everyone out there and say that SUCCESS, what ever you feel it is, lies within your own hands, so “go out and be a SUCCESS; don’t wait for failure to overcome you. This is the time of year that everyone comes up with New Year’s resolutions that they usually don’t stick to. I urge everyone to rather visualise the 2015 they want and to take action steps to make it a reality!! !